Elemental Ge is fundamental in condensed matter physics. Like the lighter elements in its family in the Periodic Table, C and Si, Ge crystal structure changes in Ge from the semiconducting diamond-type structure to metallic phases with increasing coordination. As such, accurate determination of the structures and transition pressures is an important goal of high-pressure experiments. As an important element for semiconductor industry, Ge has many advantages over Si. The heavier element has higher intrinsic electron mobilities, higher intrinsic carrier concentrations, and larger bulk excitonic Bohr radii, enabling integration with current semiconductor processing technology. Ge’s compatibility with group III-IV materials (e.g., good lattice matching with GaAs) and Ge oxide’s optical properties allow realization of radial integrated optoelectronic circuitry designs. Researchers Xiao-Jia Chen, Viktor Struzhkin, and Ho-Kwang Mao from Carnegie and Yue Meng from HPCAT, along with collaborators from China, designed delicate experiments to obtain a complete high-pressure phase diagram of compressed Ge. Their results show extraordinary agreement between theory and experiment in terms of the way Ge behaves under pressure. 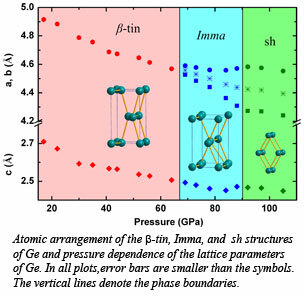 Their results, published in Physical Review Letters, show that under a pressure of 66 GPa, Ge undergoes a structural change from a metallic white tin structure to an orthorhombic Imma structure. It then undergoes another change under pressure of 90 GPa to the simple hexagonal structure. These findings matched with theoretical predictions about the element’s behavior under extreme pressure [Chen et al., Phys. Rev. Lett. 106, 135502 (2011)].